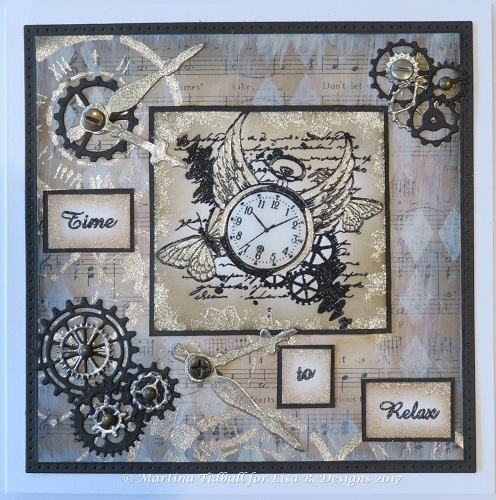 Welcome to Lisa.B.Designs : Time to Relax - Steampunk Style! Good morning all! 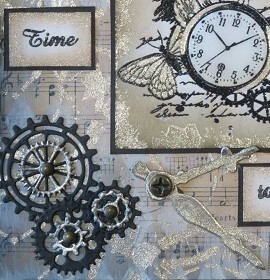 Martina here with this week's take on the time themed stamps designed by Lisa B. for Imagination Crafts. I started my card with the idea to use some old sheet music as the background. I cut the most interesting section from the page and then darkened it with some Vintage Photo, Gathered Twigs and Black Soot Distress Ink. Next I wanted to make the music more in the background, so lightly dry-brushed some Chalk White MDF Paint over the whole piece. In random areas I also stencilled sections of the Diamond Stencil, again with more paint. Once dry, I masked off the clock face from the Time Stencil and used this with Platinum Starlight Paint to add detail to one side of my paper. While that was all drying, I turned my attention to my topper. Cutting a small piece of Super Smooth Card to size, I coloured it with the same Distress Inks as before and the stamped the focal image stamp from the Time To Celebrate Stamp Set. I heat embossed the whole image with Wow Clear Superfine Powder and the painted the wings, clock rim and butterflies with more of the Platinum Starlight Paint. I also stamped around the edge of my topper with more of the paint, using the little 'squiggly splat' (not sure that's the technical name for it, but don't tell Lisa!) from the Take Time Stamp Set. Apologies at this point, my ability to take step-by-step photos this month appears to have been compromised... Once I had mounted my topper panel, I wanted to add some interest on the edges and in the corners. Using the Gears Die from Craft Emotions, I cut various sizes in black card until I had a nice selection. I painted a few of the paper cogs with the Starlight Paint, along with some cogs from the Gears and Cogs Craft Emotions Wooden Elements set to add some different depths. The screw brads and clock hands were from my stash. I stamped, embossed and cut my chosen words from the Time to Celebrate Stamp Set to finish my card. I am definitely loving the whole 'layering' thing on my cards at the moment, in fact I am finding it VERY tricky to make those 'clean and simple' cards that everyone raves about! P.S. You can find information about Lisa's PaperArtsy & Imagination Crafts' Textiles workshops HERE & bookings can be made via the website. Love the colours.....have to try this combination.